Can You Benefit from Adult Orthodontics in North Dallas? There are many people who work extremely hard to overcome the embarrassing, prepubescent look they had in high school. They polish their overall look with a more mature haircut, upgrade their wardrobe, and even improve their speech—but one thing stands in the way of them feeling more confident about themselves: their crooked teeth. If this sounds like you, but you can’t bear the thought of getting traditional braces, you’re not alone. Clear aligners have been a go-to for many mature patients, actually standing as the preferred method for adult orthodontics in North Dallas. Learn more about clear aligners and how you may be able to benefit from them in this week’s blog post. As mentioned above, there are many adults who feel less than great about their smile because of overcrowding, crooked, or misaligned teeth. Sometimes, even gaps can hold someone back from loving their teeth. If you were unable to straighten your teeth in the early development of your smile with traditional braces when you were younger, you might be the perfect candidate for adult orthodontics. You may have even had a great smile growing up, but wisdom teeth development may have shifted your smile. Either way, adult orthodontics can help you regain confidence and optimize your oral health again. 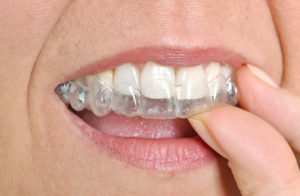 Modern clear aligners provide a straightening system that utilizes a series of smooth, clear plastic aligners to guide your teeth into their correct places. These custom clear aligners apply gentle pressure, pushing your teeth into the right spots. The straightening treatment is ideal for mature patients because it straightens the smile in much less time than other options, among other benefits. Why should you consider getting clear aligners? You’ll be expected to visit the dentist much less than with other orthodontic treatments. Your clear aligners are removable, allowing you to enjoy your favorite foods. You’ll be able to effectively clean your teeth and clear aligner system because they are removable. You won’t have to experience uncomfortable tightening appointments, poking brackets or wires, or other uncomfortable side effects because the aligners are crafted from clear, smooth, plastic. If you’re interested in learning about how you personally can benefit from adult orthodontics—specifically clear aligners—feel free to call your local dental office. Dr. Greer want to help patients achieve a better smile with the utmost comfort and convenience. Offering clear aligners is just one of the many ways we make it easier for patients to receive the dental care they truly need. In the case that clear aligners aren’t the best option for you, we still have other ways to help you achieve a healthier, straighter smile. Contact us today to find out which service is best for you! Comments Off on Can You Benefit from Adult Orthodontics in North Dallas?